HUBER asks: What drives a decision when choosing which thermoregulator to buy? Temperature range? Cooling power? Pump capacity? None of these indicate how well the thermoregulator performs its primary function, TEMPERATURE CONTROL. Temperature control is about power transfer, not power. By efficiently transferring thermal energy, better control is achieved with smaller and less expensive thermoregulators. That’s why at Huber we have developed the best energy transfer system, giving better temperature control in smaller units, costing less in resource consumption and wider process profit margins. Maximizing efficiencies and other less obvious factors in the thermoregulator gets you the very best results. Efficient energy transfer = good temperature control! The family and employees of Peter Huber Kältemaschinenbau AG mourn the loss of their founder, long-standing CEO and Chairman of the Supervisory Board Peter Huber. The company founder died on June 12, 2018 aged 77. Peter Huber was born on 16 February 1941 in Offenburg. After training as a machinist, he first worked in the family electrical business. In 1965, at the age of 24, Peter Huber took part in one of the first refrigeration courses at the "Karlsruhe Institute of Technology"
Many technical applications depend on a reliable cooling solution. Huber Minichillers and Unichillers are the ideal solution for environmentally friendly and economical cooling in laboratory and industry. Huber Kältemaschinenbau offers a variety of measuring equipment for installation in the temperature control circuit in order to measure and control the flow rate. At ANALYTICA 2016, Huber will be showcasing new solutions and further developments in temperature control from -125 °C to +425 °C for research laboratories and process industry. Huber Kältemaschinenbau introduces the new Unistats ‘P’ for applications with high pressure drops. Since 1980, Unistats are the leading technological solution for efficient temperature control in process engineering. The Unistat principle ensures maximum process reliability and process stability and guarantees reproducible temperature control results. Unistat pumps are purposefully designed so that a maximum circulation creates an as turbulent flow as possible, a large heat transfer coefficient (alpha value) and therefore a highly efficient heat transfer at the heat exchangers (evaporator and heater). HUBER presents a range of new products and developments at CPhI in Shanghai. Huber Kältemaschinenbau presents new E-grade at ACHEMA 2015. The new E-grade “Explore” for Unistats is more than just another function package. E-grade “Explore” visualizes useful information about temperature, heating / cooling capacity and pump capacity in the system directly on the touch panel. E-grade “Explore” is a further development of the Unistat technology and utilizes the outstanding features of Unistats to display important process and performance data directly on the device display. Relevant measurements can also be processed via the digital interfaces. E-grade “Explore” turns a Unistat temperature control unit into a process technology and process engineering development tool. Huber temperature control units are powerful and standardly equipped with natural refrigerants. Huber Kältemaschinenbau has further expanded its range of classic heating and cooling thermostats. The program offers two product lines: While the CC models meet the highest standards, the MPC models stand for simple operation and affordable prices. We offer immersion circulators, bath and circulation thermostats for temperatures from -90 to +300 °C. The product line also includes the smallest cooling thermostats in the world, the Ministats. With their range of Immersion Coolers, Huber Kältemaschinenbau offers a flexible solution for a variety of cooling applications. The new Grande Fleur, a Huber Kältemaschinenbau product, extends Huber's portfolio of dynamic temperature control systems. The only chiller specially designed for cooling rotary evaporators. Unistats set new standards in thermodynamics. The model range is enhanced with new functions. Huber Kältemaschinenbau has launched a new mobile website in German and English customised for all available mobile devices. Huber Kältemaschinenbau offers a solution for precise temperature control of large-volume production reactors of more than 10,000 litres. The innovative Unistat hybrid system allows economical optimization of existing heating and cooling systems. Temperatures down to -125 °C or up to +400 °C can be realised. Huber has a winning hand with a suite of very compact, high efficiency and low-cost products. Precise temperature control has a significant influence on performance and quality in chemical process engineering. The Unistat range of temperature control systems ensure accurate temperatures and stable process conditions in research laboratories, pilot plants and kilolabs worldwide. The new Unistat Hybrid technology offers solutions for temperature control of large scale production reactors,enabling an affordable, partial modernisation of existing central plant cooling/heating systems. Small, smaller, Ministat:Exceptionally compact and powerful! HUBER Petite Fleur®, Ministat® and Minichiller® are environmentally friendly and cost-effective thermoregulation machines charged with natural refrigerants, perfectly suited for laboratories: Eco friendly, small dimensions and low investment costs. The new catalogue from Peter Huber Kältemaschinenbau presents high precision thermoregulation solutions for laboratories, pilot plants and production processes. In the new 2013/2014 catalogue a range of new innovations are shown. Highlight is the new touchscreen controller Pilot ONE®! Budget priced laboratory temperature control machines. Aug 17, 2010 The MPC® range of heating and cooling machines are used for typical temperature control requirements in the laboratory. HUBER Minichillers reduce water consumption and improve process efficiencies Jul 14, 2010 With the ever rising cost and environmental impact of waste water, Scientists and Facility Managers are increasingly looking for alternative ways of cooling applications in the laboratory. A calculation, based on water consumption, shows that in a working week (8-hours a day, 5 days a week), the Minichiller® saves approximately 48,000 litres of water, and as the Minichiller® is low in cost, it offers a fast return on investment which can be measured in months. 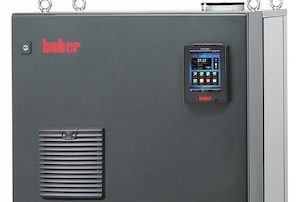 Decrease process costs with the NEW Unistat 905 from Huber Jun 7, 2010 The NEW Unistat 905w is the latest addition to the Unistat® range of high performance circulators from Huber. With 6kW heating power, cooling powers from 4,5kW @ 0°C and 0,7kW @ -80°C and a temperature range of -90 to 250°C the new 905w brings a tailored cryogenic solution to lower volume reactors. NEW 2010 catalogue from Huber Mar 19, 2010 Peter Huber Kältemaschinenbau GmbH are pleased to announce the release of the new 2010 catalogue. The NEW 98 page catalogue is a comprehensive guide to the entire Huber range, from simple bench-top circulators and chillers to industrial scale systems. Efficient thermal energy transfer = good temperature control + reduced process costs! Feb 23, 2010 Leading the way in temperature control, Peter Huber Kältemaschinenbau GmbH realise that temperature control is about power transfer, not power. By efficiently transferring thermal energy, better control is achieved with smaller and less expensive thermo regulators. The next generation of remote communication for temperature control Feb 17, 2010 Leading the way in temperature control, Peter Huber Kältemaschinenbau GmbH has been manufacturing a range of low volume hydraulically sealed thermostats since 1991. They cover the temperature range of -120...425°C with cooling powers from 450 watts at 0°C up to 24 kW at -60°C and 2 kW at -100°C. Now in 2010 Huber will be unveiling the next generation of modern communication at Analytica.